Osiris, Isis and Horus are very key characters in the ancient Egyptian culture and their story is truly beautiful. Osiris was Egypt’s greatest king who ruled through kindness and persuasion. Having civilized Egypt, Osiris traveled to other lands. Osiris was later dismembered by his brother who wanted to rule Egypt. His body parts were scattered all over Egypt in a bid to get rid of him, but Isis gathered up all the parts and bought Osiris back to life again. Cosmic Master Osiris is working with the 1st Ray Master, Lord Maha Cohan, helping the world to ascend into the higher mind, therefore enabling us to access soul realization. Connecting with Osiris will bring awareness on all levels of soul, spirit and physical vibration. He will connect you to the greater awareness of God source and give you the direction and strength to carry out your soul purpose. Osiris will teach you to become aware of thought control. In this process he links to Saint Germaine on the 7th Ray to increase the powerful higher mind. Wearing Lapis will vibrate through the colour and open your inner wisdom to the truth and higher mind. Burning Lavender will relax the mind and body so information may fill your consciousness. Osiris and Isis are an Ascension Couple. 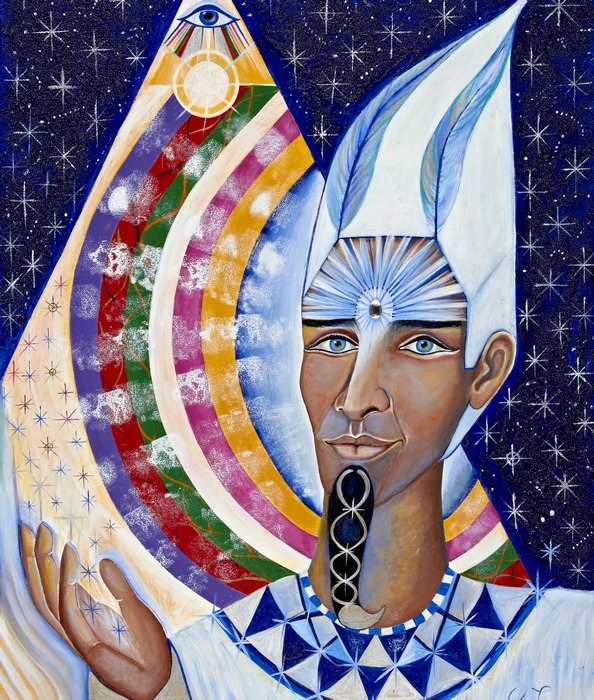 Painted in 2011, this painting of Osiris shows his higher mind and connection with the Cosmos. The Ascension pyramid is crowned with the 3rd eye – the all Seeing Eye. All 13 rays come through in the rainbow colours against the pyramid.